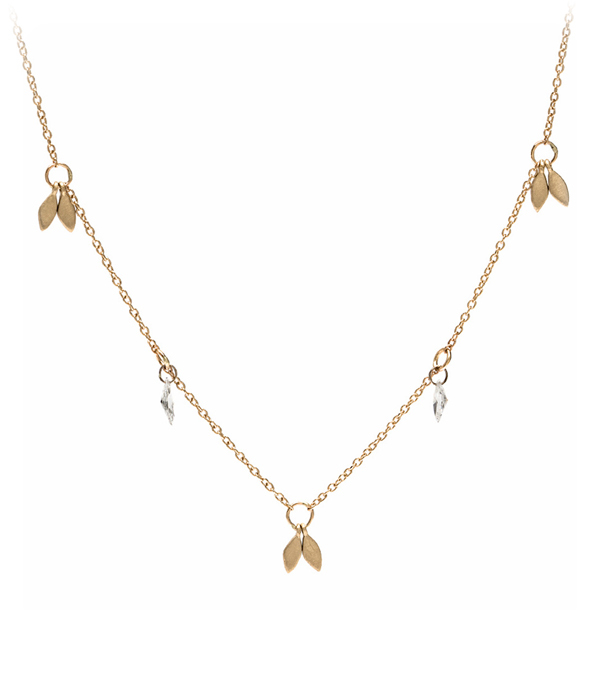 Like the falling golden leaves of autumn or the feathers of a rare bird, this effortlessly chic bohemian diamond necklace romances us with its subtle movements and golden glow. The drilled marquis diamonds make for a barely-there look that can be worn daily with your favorite jeans and cotton T-shirt or dressed up and layered with any of our dainty necklaces from the Sofia Kaman Signature Collection. Understated and cool with a touch of glamour, this diamond layering necklace embodies California bohemian chic. We think this piece makes the perfect travel companion and a great staple for every woman who loves little details. This diamond and gold necklace features 0.22 ctw of sparkling diamonds and is handcrafted by our artisan jewelers in Los Angeles.